There aren’t many celebrations like that any more, but personal traditions still abound. A friend of mine lights a candle each Halloween for any friends and relatives who have died since last Halloween. It’s an old Celtic belief that those who leave after sunrise on November 1 remain on Earth until sundown on October 31; she sort of sends them on. I think that’s a lovely sentiment, and nicely in keeping with the mood of the day. It’s not exactly a tradition, per se, but every year I keep watch for the big Virginia barn spiders to show up on our front porch. They appear out of nowhere every autumn, perfectly outfitted for the season in orange and black, and it doesn’t really feel like fall around here until two or three have set up shop outside the front door. Today is also my wedding anniversary–which is a whole set of traditions all by itself–but Shadow Jack and I always nod to the holiday by exchanging Halloween-themed cards. What special things do you do on Halloween? Share your traditions in the comments! Note: I’m participating in the unfortunately-acronymed NaBloPoMo again this year, so there will be a post every day of November, including weekends. Can you hardly wait? I thought so. Now that Halloween is at hand, Funkins and other fake pumpkins should be on clearance at your local craft store. Go get one and turn it into a diorama like this one, from Craftster user Miz.Persnicket. She’s got a whole little graveyard inside, complete with lurking rats and tap-dancing skeletons. She doesn’t give any directions, but from her supplies list it appears that she cut a hole in the pumpkin using a dremel tool (you could also use a little jigsaw), then painted the inside and the cut edge. The gravestones appear to be the little foam jobs you see as table decorations (they’re also available at Oriental Trading), and the grass is reindeer moss. There’s all kinds of stuff you could do with a pumpkin as a frame: A Macbeth-type blasted heath with bubbling cauldron, a mad scientist’s laboratory, a cave full of bats, a dubious-looking gingerbread house…you get the idea. It’d be fun to do a whole series of these, each with a different scene inside, and make a big tabletop display. The U.S. FDA is warning consumers not to consume White Rabbit Creamy Candy or Koala’s March Crème Filled Cookies because they may contain melamine. The Canadian government is warning the public not to consume Sherwood Brands Pirate’s Gold Milk Chocolate Coins (which may also have reached the U.S.), also due to melamine. Solid Alliance, a Japanese gadget maker that has a reputation for producing, as Engadget puts it, “zany crap” (they followed up last year’s USB Ghost Detector with a more-featureful Ghost Radar), has recently produced some zany crap that’s pretty appealing. Their USB flash drive is a custom-sized ring shaped like a big skull. The jaw pops off to reveal a USB plug. It’s got a 2GB capacity and comes in a variety of colors. Yours for $150 from Geek Stuff 4 U. This is just such a Lucrezia-Borgia-meets-Cyberpunk sort of gadget. I love it. After an original release date of last April, this rock opera is finally scheduled for limited release (Los Angeles, San Francisco, New York City, and Las Vegas) on November 7 and will be released on DVD next January. It’s a kind of cyberpunk-gore-goth-drama…thing. The plot involves a not-too-distant dystopian future where massive organ failure is rampant and a company called GeneCo provides transplants for a price. Those who can’t keep up the payments on their new organs may have them repossessed by company-employed legal assassins. One of these assassins, played by Anthony Stewart Head, has to keep his profession secret from his daughter whilst also targeting someone close to him. Sounds…angsty. Head is probably best known on this side of the pond for playing Giles on Buffy the Vampire Slayer, but he’s actually got a great voice and a lot of stage-acting experience, including a turn as Dr. Frank N. Furter in a London revival of The Rocky Horror Picture Show (a bit of intrepid googling will turn up pictures of him dressed as Frank. Don’t say I didn’t warn you). Paris Hilton also “acts” in the film, but since her role is a vapid, spoiled, rich girl I don’t think she’ll have any trouble pulling it off. There’s an official movie site, but I will warn you that it’s all Flash-based navigation. Boo, hiss. Anyway, looks like fun. Thanks to Shadaughter and her mildly unhealthy Anthony Stewart Head addiction for pointing this out to me. 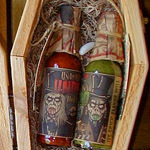 There are a zillion hot sauces out there, so it stands to reason that a few have spooky names. If you happen to like things on the hot side, here are a few you might try. eXtremefood specializes in “After Death” sauce. The main ingredient is habaneros, and the stuff also includes cayennes and pepper resin. I think you’d be better off buying a bottle, using the contents to kill weeds, and refilling the bottle with something reasonable like Tabasco. They also offer the milder Sweet Death, plus Sudden Death, Muerte Sauce, and Death Rain. Various other brands include Devil’s Brew, Death Wish, Dia de los Muertos (with skeleton keychain! ), Scorned Woman, Voodoo Juice, Widow (with a spider on the bottle), Boneyard Brew, Hell’s Inferno, Brain Damage, Bad to the Bone, Sea Witch, and Satan’s Blood, to name just a few. The Day of the Dead is coming up soon (November 1); if you’re planning a party, pick up a few bottles of thematic hot sauce to give as favors. This is one of those facepalm why-didn’t-I-think-of-that? projects: Heidi at My Paper Crane came up with the brilliant idea of drawing skeletons on gingerbread cookies. They’re adorable. It strikes me that you could take this a step further and do gingerbread in a variety of anatomical-textbook cross sections: Do some as skeletons, others with internal organs, etc. Molasses Gingerbread Cookies – These are a little softer and more cakelike than traditional crisp gingerbread. If you don’t have a piping bag for the icing, put it in a plastic baggie and snip off one corner. Make sure you don’t make the hole too big, since you’ll want a fairly fine line to draw the individual bones. Bonus Link: When I was looking around for a gingerbread cookie recipe, I ran across instructions for decorating a haunted gingerbread house. So cute! Winter is coming (I’m Northern Hemisphere-bigoted), which means chapped, flaky skin. Here are a couple of super-easy homemade scrubs to help give you a rosy glow. Or, y’know, a doomed pallor. But a healthy doomed pallor. You can use any kind of mild oil in these recipes: Sweet almond, olive, avocado, macadamia, untoasted sesame, grapeseed, rice bran, jojoba, coconut, or a mixture. Coconut oil can be a bit harsh, so I wouldn’t recommend using it by itself. Make sure that fragrance oils are meant for use on the body, not as scents for candles or potpourri. Certain spice essential oils (like cinnamon and ginger) can irritate skin, so add them sparingly and avoid using scrubs that contain them on your face. Don’t use salt scrubs on cuts (duh). If the brown sugar has any hard lumps, whirl it briefly in a food processor or blender. Combine sugar with oil in a bowl and mix well. Add the essential oils a few drops at a time, mixing them in and giving the scrub a good sniff before adding more. Mix the salt and 3/4 cup oil in a bowl, adding a bit more oil if the salt seems too dry. Mix in the fragrance oils. Mix sugar, salt, and cocoa in a bowl. Stir vanilla extract into oil, then pour over dry ingredients and mix thoroughly. These make a nice gift, too. Tuck a jar of scrub into a little basket with a scented candle and a pretty washcloth, and you’ve got a quick and easy “pamper me” gift for someone special. And hey…you’re someone special. Go run a hot bath. Two fairly old jokes, nicely woven into a country song. Prepare to have the chorus in your head for a while. “Stygian” Dark Chocolate – H.P. Lovecraft’s short stint as a copywriter for Whitman’s Samplers. Chernobyl Matryoshka – Makes you chuckle and wince at the same time. Catalog of Unfit Toys – Featuring items such as the Ennuija Board and the Berenstain Bears Go Primal Treasury, this blog has something for every child on your list. Assuming that you hate every child on your list. Yearbook Yourself – Upload a photo of yourself and create “yearbook” photos from various decades. Some of the hairstyles are simply wonderful. Ashes to Caches – Amusing look at high-tech ways to dispose of your mortal remains. This is my favorite Wondermark cartoon of all time.